Pongal is a Tamil four-day long harvest festival. Thai Pongal is mainly celebrated to convey appreciation to the Sun God for providing the energy for agriculture. The day marks the Sun’s Uttaraayanam (the sun’s six-month-long journey northwards).the word Pongal, in Tamil Language, literally means "boiled rice" (a rice and lentil dish) but metaphorically means prosperity. The origins of the Thai Pongal festival may date to more than 2000 years ago. Epigraphic evidence suggests the celebration of the Puthiyeedu during the Medieval Chola empire days. The day preceding Pongal is called Bhogi. On this day people light a bonfire called Bhogi Mantalu with logs of wood and useless household articles, wooden furnitures, which are no longer useful thrown into the fire. Bhogi is celebrated in honour of Lord Indra – the God of rain in Hindu mythology, who is worshiped for permitted rain for good harvesting. Farmers perform a special puja with ploughs and sickles before cutting the newly-harvested rice. The main celebration, also known as Thai Pongal, observed on second day of the four day long festival. This day also known as Makar Sankranthi and celebrated throughout India. People decorate their homes with banana and mango leaves and decorate the floor with beautiful Kolams or Rangoli (decorative patterns drawn using rice flour). During this festival milk is boiled in a vessel and when it starts to bubble and overflow, freshly harvested rice grains are added to the milk and at the same time conch is blown. 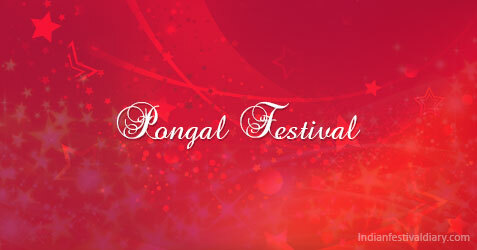 The day following the Pongal is called Maattu Pongal which is the third day of the four-day Pongal festival. In Tamil, the word “Maattu” means “bull” and this day of Pongal is for celebration of the cattle, particularly bulls that play a vital role by working hard to help the farmers to raise crops on their fields. The cattle are washed and their horns are painted, multi-coloured beads and flower garlands are tied around their necks. Devotees worship their cattle and pray for good harvest. According to legend once Lord Shiva sent his bull Nandi to earth to convey his message to people that they should have an oil bath every day and eat once a month but Nandi wrongly announced that people should eat every day and take oil bath once in a month. Lord Shiva became so angry with Nandi that he cursed Nandi and banished the bull to live permanently on the earth to help farmers to grow extra crops for people to eat every day. The last day of four-day long Pongal festival is called Kaanum Pongal, it is the day of relaxation and enjoyment and people spend time by socializing or visiting each other’s house. Meaning of the word Kaanum is "to visit". On this day women feed the birds with rice and pray for the prosperity of their brothers. Brothers pay special tribute to their married sisters by giving gifts. This day is the favourite day for non-vegetarians as they do not eat non-vegetarian dishes during the first three days of Pongal festival and save it the day of Mukkanuma.